Facebook to Unveil Facebook Phone Next Week at their Mobile Event? Facebook has just sent out invites for a “Mobile Event” which they are hosting on November 3 at their Headquarters in Palo Alto, California. The question which immediately pops-in mind is: could this be the event where we will finally get to see or hear about the much rumored Facebook Phone? While Facebook was quick to deny it back in September, they did however said that they are working with partners for deeper integration of Facebook into existing solutions. So while the chances of Facebook unveiling an actual “Phone” are slim, but the possibility of it cant be ruled out entirely. Maybe we will get to see a mobile OS (based on Android ? ), or maybe something related to the mobile version of Groups or Places feature? Or maybe the much awaited Facebook for iPad app, and for Windows Phone 7 as well? Well who knows. 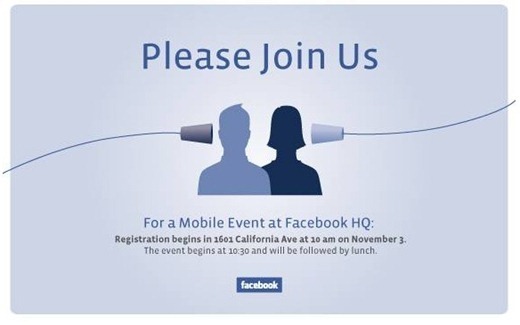 You can join us next week on Wednesday, November 3 for the Facebook Mobile Event. We will be reporting all the announcements as they happen live. In the meantime we want to know, what do you think Facebook will announce come next week?